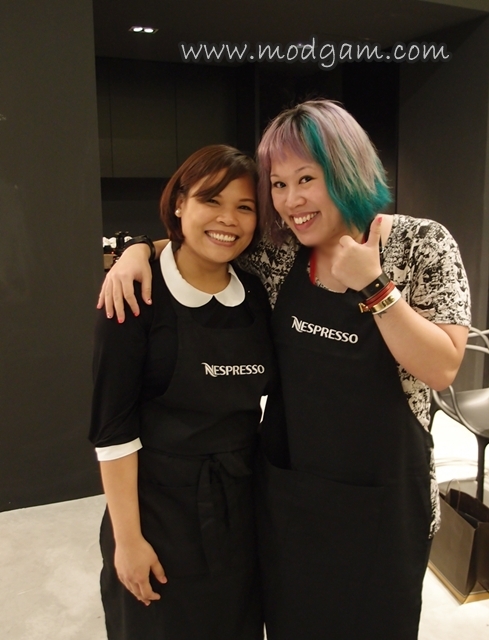 I am excited to be invited for an exclusive Savour 2013 media preview of the Nespresso Atelier Session. From the coffee cherry to the moment of tasting, Nespresso masters each step in the creation of its wide range of Grand Cru coffees. 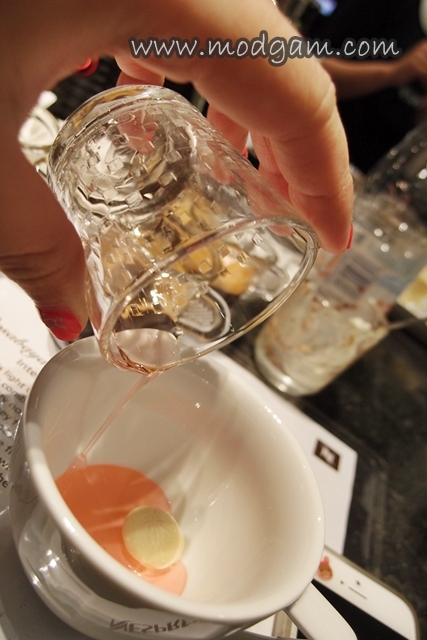 Each offers distinct aromas and flavours that cater to individual preferences, allowing consumers to indulge in unique tasting experiences. 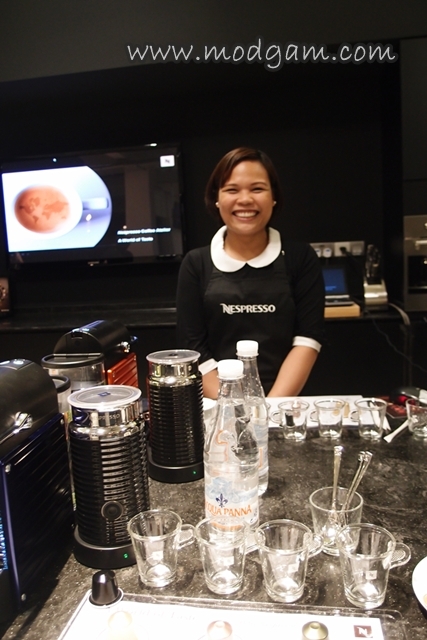 By the end of this exclusive class, we are all coffee experts! Wheeee! 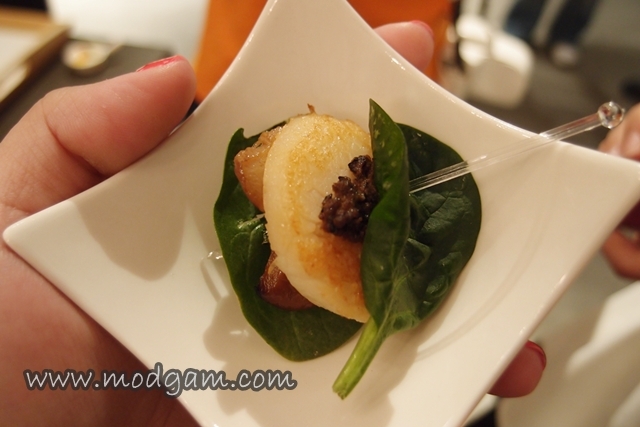 Yummy canapes were served and my favourite is the scallop with truffles! Come and experience the Ultimate Coffee Moment with me while I share tips on how to “check” if you are really getting that gourmet coffee worth paying for! 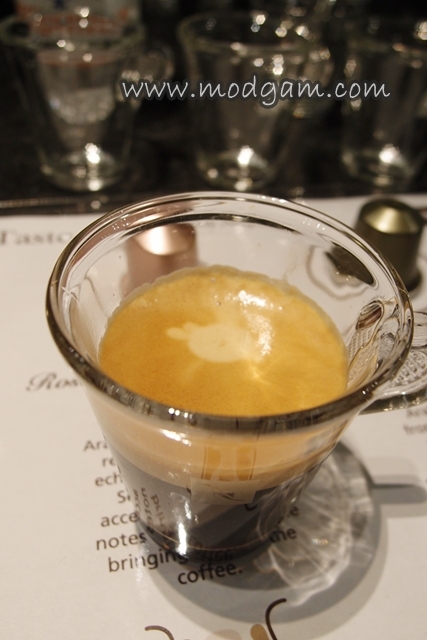 I learned so much on the alchemy between coffee of exceptional quality and freshness to give you the perfect espresso! Check out our very cool chic “classroom” all set up and ready for some gourmet brewing! 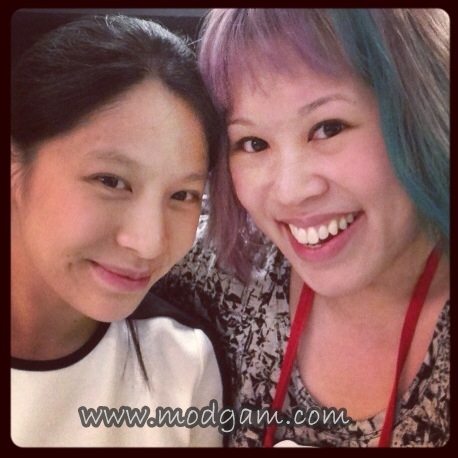 That is our smiley teacher there at the background. 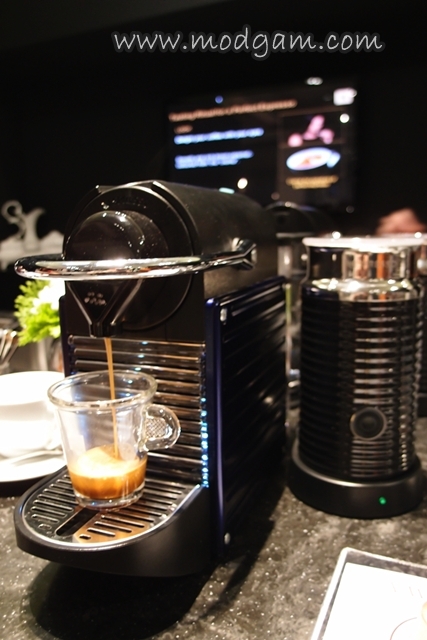 Did you know the Nespresso Pixie is eco-friendly and the aluminium panels is made up of 98% recycled Nespresso Capsules? To save energy, the machine auto powers off. I love that it comes in 6 different colors and I’m sure you’ll find one. 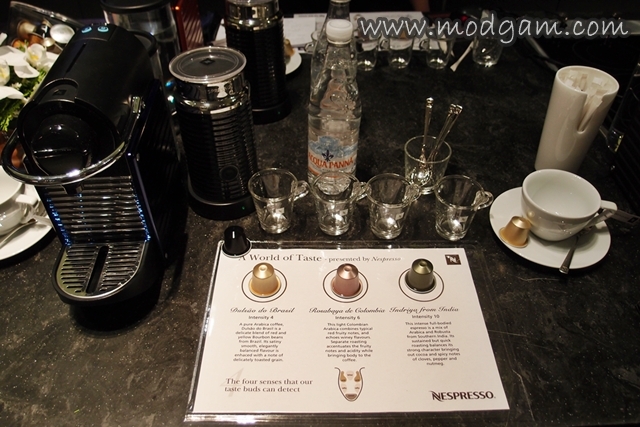 During the lesson, we were taught how to appreciate coffee using our sight, smell and taste. 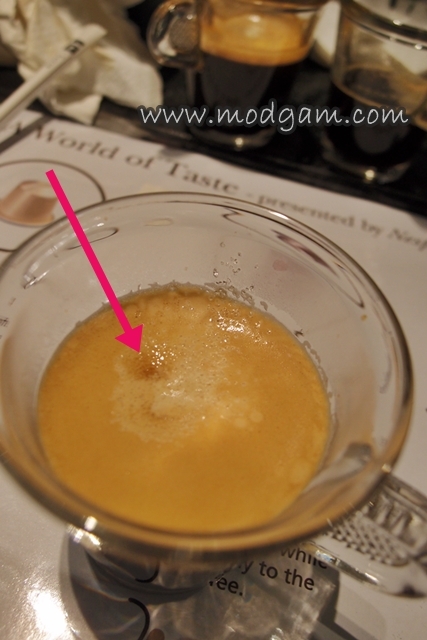 Firstly, check for the bubbles in the layer of golden brown crème. The bubbles should be small and fine. 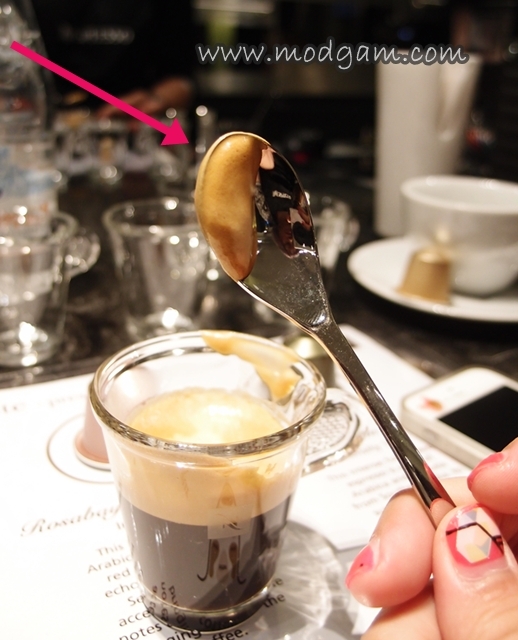 Next, scoop up the crema, it should stick to the teaspoon and not drip. 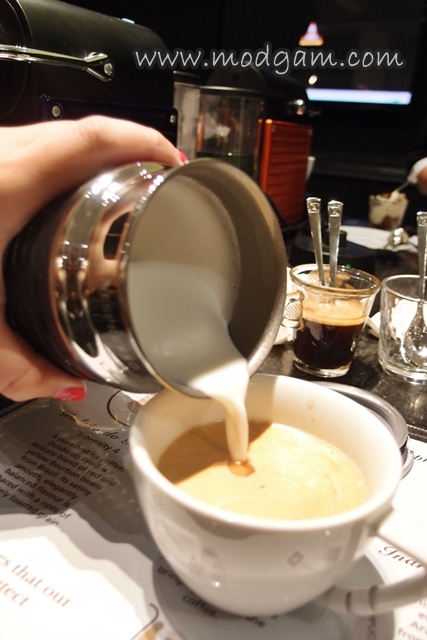 And then you asked “What if your coffee doesn’t have any crema?” We have the solution for you! Read on. 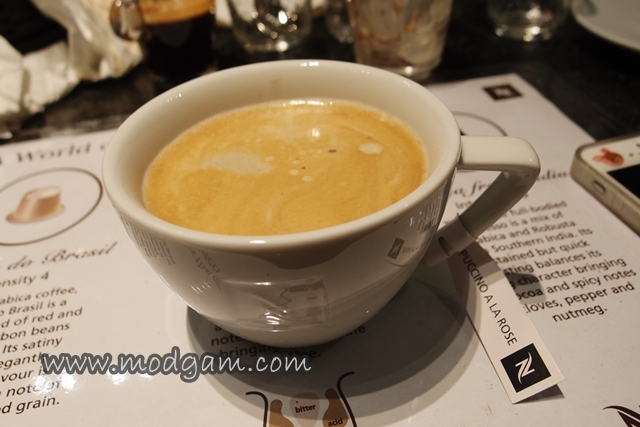 If your coffee doesnt have any crema, don’t worry. 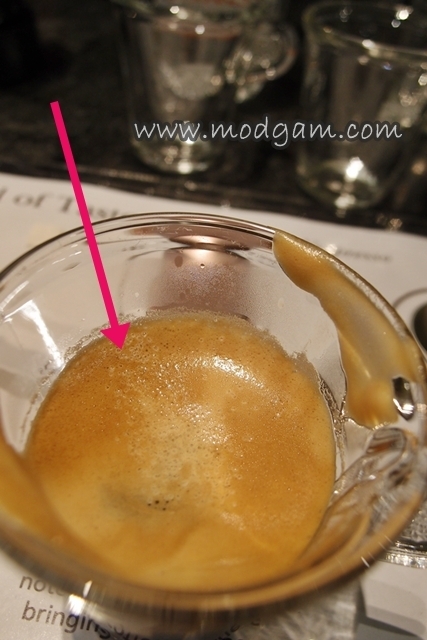 Pour sugar into your coffee, it should “float” on your coffee for a few seconds before sinking. This is a good coffee worth paying for! Smell your coffee and slurp a reasonable amount letting the coffee flow all over your tongue before swallowing it. This is my favourite part of the class. 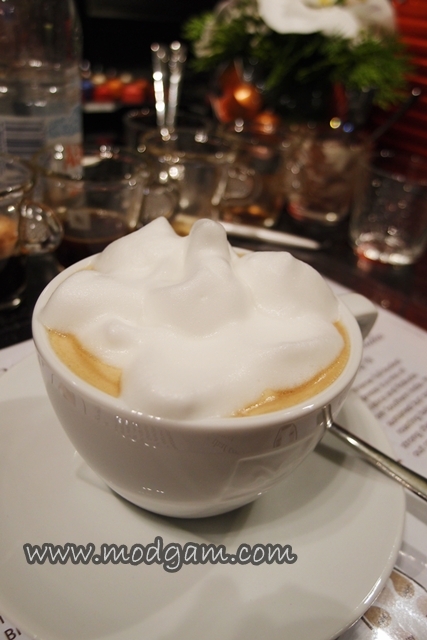 The receipe to Cappuccino A La Rose! I will drink coffee if its Cappuccino A La Rose everyday! It has got to be the most delicious coffee I’ve drank. 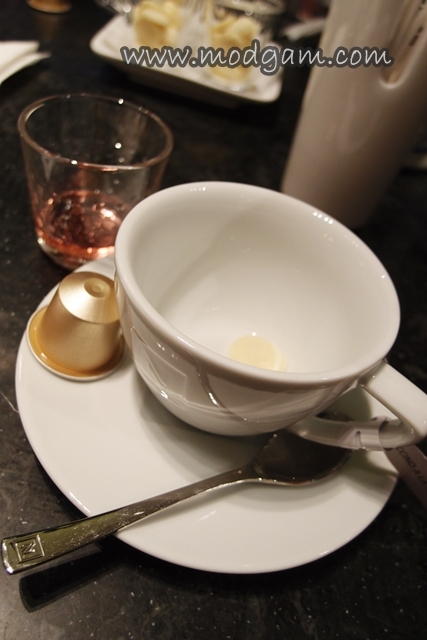 It is so easy to make your own cup of Cappuccino A La Rose for all you need is a shot of espresso coffee, 30ml of rose syrup and a piece of milk chocolate. 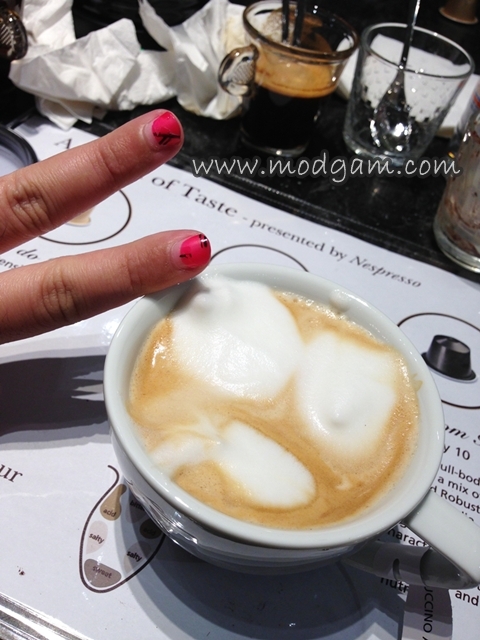 We were encourage to beautify our coffee and can you see my not so smiley foam face? I was absolutely jealous of Melvin’s snow mountain or whatever you call that! Looking so pretty right? 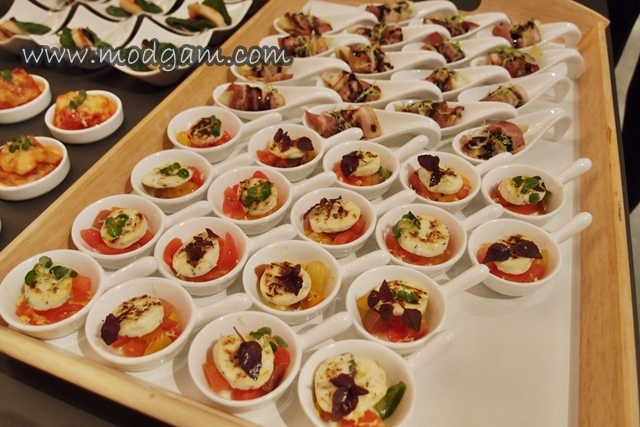 Before I forgot, we were served Tiramisu made from Nespresso. 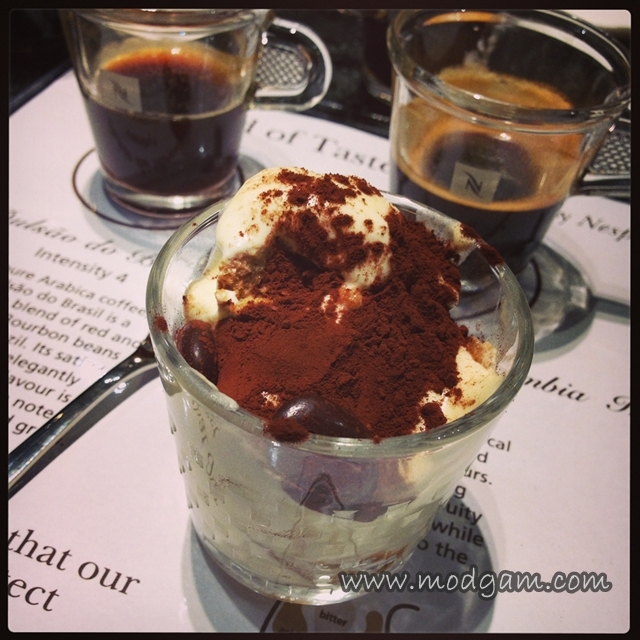 It has got to be the most delicious Tiramisu I’ve tasted. HONEST! I am no fan of Tiramisu but everyone were asking for 2nd serving! 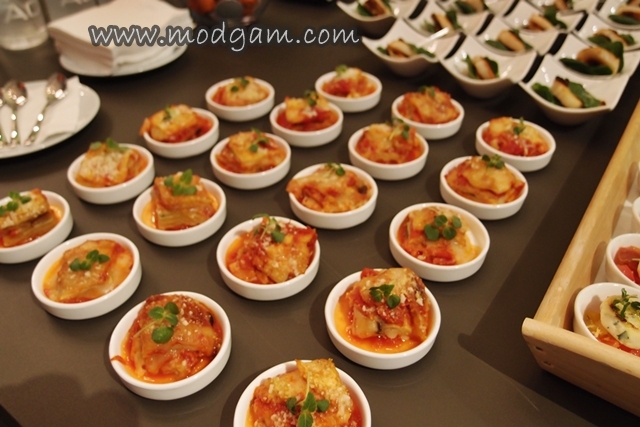 Yes, I kid you not, it looks as good on the outside and inside our mouth! Thank you Teacher! I’ve learnt so much and I sure know how to make sure I’m paying a coffee worthy of the price now. Nespresso coffee rocks! Cappuccino A La Rose, here I come! 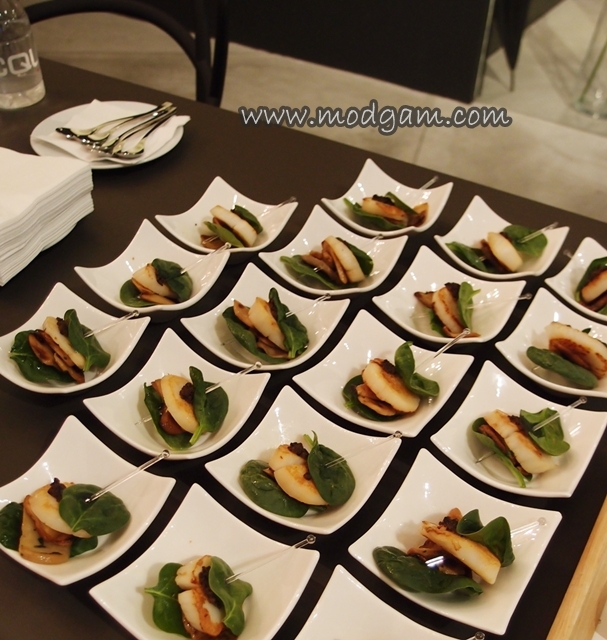 Nespresso’s Crealto Food Trail – introducing 4 unique coffee-infused dishes!